This is what you can expect here at Volta Hotel Akosombo. What could be better than staying in a room of quiet elegance? How about indulging your senses with one of Ghana’s breathtaking views stretched out before you? 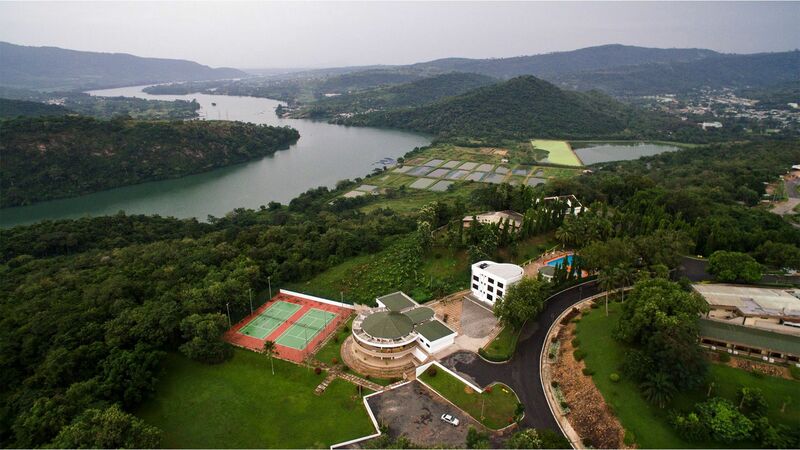 We are situated on a 12.6-acre land overlooking the Volta Lake (the second largest man-made lake in the world) and the Akosombo hydroelectric dam. Volta Hotel is definitely a haven of comfort, hospitality, and natural beauty. The Volta Hotel in Ghana provides a fantastic view of the lake, dam, and adjoining mountain slope. We offer Standard and Twin Rooms, as well as Private Villas and Executive Suites. Each dwelling gives a vibe of sophisticated elegance and complete relaxation. This comes courtesy of our high-quality furnishing and amenities. Given our hilltop location, we make it sure that our guests can easily access the hotel. We provide pickups to and from the airport, as well as shuttle services that can get you to the major attractions in the region. Volta Hotel Akosombo played host to numerous memorable historic events. These include the signing of the Liberian peace accord in 2002 and ECOWAS secretariat conferences. We also hosted World Bank conferences. The hotel also earned numerous awards and recognition. These include a Regional and National Hotel of the Year Award (3-4 star category) by Ghana Tourist Board. Spacious beds, full air-conditioning, and full Wi-Fi connection. These are just some of the perks of staying at one of our rooms. Our accommodation are made for easy relaxation in an elegant setting. Enjoy access to cable TV, writing desk, mini-bar, coffee/tea maker, and private bathroom complete with toiletries. High-quality facilities and services are what you can expect from a hotel of our standards. We also offer exciting boat cruises with our pleasure boats, which can take you around the second largest man-made lake in the world. After a day of adventure, you can feast on our sumptuous offerings of English, Continental, and Chinese cuisines. Our hilltop location gives you some of the best views in Ghana. Being high up in the hill doesn’t make us less accessible though, thanks to our shuttle services. Volta Hotel Akosombo is just 90 minutes away from Kotoka International airport in Accra, accessible via the Tema-Michel Camp road and Dodowa road.